Citibank customers can get their concerns or queries answered in Five ways. They are 24×7 CitiPhone, Visiting Branch and ATM locations, write to customer care center using online query form or write a letter and post it to customer care center through an ordinary or registered post, Live help called AskMe, checking FAQ’s section. Any forms required can be downloaded from Forms Center. 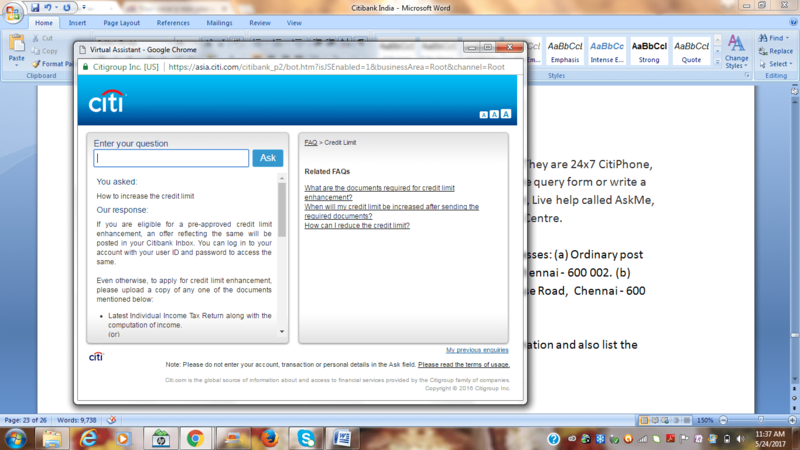 You can also use the Citibank Net Banking for funds transfer and clarify query’s. (a) Ordinary post need to be sent to Citibank N.A., P.O. Box No. 4830, Anna Salai Post Office, Chennai – 600 002. (b) Registered post need to be sent to Citibank N.A., Mail Room, No. 2, Club House Road, Chennai – 600 002. This bank also offers Citibank Credit Cards and Citi Bank Debit Cards to their Citibank Account holders. Customers can reach Citibank customer care using CitiPhone option. Customer’s phone would be virtual bank branch using Citi Phone option and take care of a majority of customer’s needs at their convenience. Citibank customers availing the facilities of a CitiBank Credit card, Citibanking, CitiBank Loans, Suvidha/Citi Priority/Business Preferred accounts, can call the customer care Number from anywhere across the globe. Customers in India need to call 1860 210 2484 (customer is charged based on his/her plan for local calling) and customers outside India need to call +91 22 4955 2484 (customer is charged for international calling). The customer is authenticated by providing account and identification details and then will be allowed to do transactions. Citibank also introduced a feature to recognize the caller’s voice and match it with the stored voice for an account for the authentication purposes. This uses voice biometrics technology. You can also check the other banks contact numbers Axis Bank Customer Care, Canara Bank Customer Care and Central Bank of India Customer Care for banking related issues. How long does it to take use voice bio metrics feature for authentication after the enrollment? After the enrollment for the feature, it takes 4 hours to use the same. 2. What happens to voice biometrics recognition, if the customer has a situation like the cold that affects voice? In the case of situations that affects customer’s voice, he/she can’t be authenticated using this feature because of voice mismatch and the standard verification questions will be asked to ensure identity. 3. Is there a centralized location for the customer to search and download the required form? Yes. The customer can use the forms center option under the “Contact Us” option on the home page.